Last week Amazon set their sights on the mobile app market, launching their Appstore for Android. This week they're attacking Android devices once again, but that's not all—they're getting into the online storage biz. 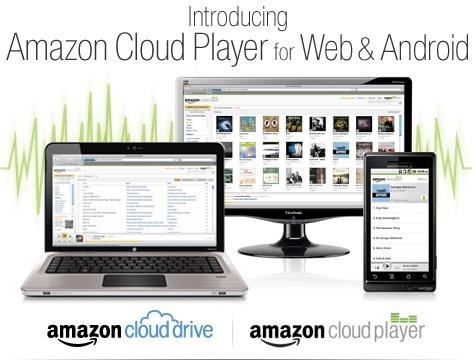 On Monday, they launched Amazon Cloud Drive and Amazon Cloud Player. Cloud Drive is an online storage space that lets you upload and store all of your digital files in one convenient place on the web. We're talking music, pictures, videos, documents—if it's digital, it can be stored on their servers. But this isn't anything new—other companies have their own versions of online storage. Apple gives MobileMe paid subscribers 20GB worth on iDisk. Microsoft provides 25GB of free storage with SkyDrive. And you get 2GB free with Dropbox, though you can opt for larger space for a monthly price. But if you're a frequenter of Amazon, the Cloud Drive could suit you better, which provides you with 5GB free. You can also upgrade for free to 20GB of storage space once you've purchase an MP3 album. Cloud Drive works with both Mac and PC, and the photos, videos and documents you store online will open up in their respective programs on your computer. The music files, in either MP3 or AAC format, can play via their web-based, streaming Cloud Player. It has basic play controls as well as playlist functionality. And with their digital music store app, Amazon MP3, Android device owners can stream their stored music directly on their phones or tablets. To get started, check out Amazon's walkthrough video to see how it works. Just go to Amazon Cloud Drive to get set up. Click on the Get Started button, sign in to your Amazon account, and agree to the Cloud Drive terms of service. And that's it! You now have 5GB of free online storage space. Now that you have your account, you can start uploading your documents, images, vids, etc. Simply click on the Upload Files button and follow the directions. It's intuitive and no different than any other online upload system, so you shouldn't have any problems. Large files will take longer to upload, but uploading a 70MB MP3 album shouldn't take more than 5 minutes with a decent Internet connection. Now that you have some music loaded, simply navigate to your music folder in Cloud Drive and click on the song you want to play. The Could Player should automatically open in a new window. You may have to agree to another set of terms of service before you can gain access to the player. As your songs continue to upload, they will automatically populate into the Cloud Player. Use the controls in the bottom left to play, skip, pause, etc. Now, if you want to bypass the $20/year price for 20GB, just purchase an MP3 album from Amazon and you'll automatically get it for free. What's better? Paying $20 then buying an album, or just buying an album for less than $10? You save money and get something for your music library. From the Cloud Player, click on the MP3 Store logo in the top right (or just click here). 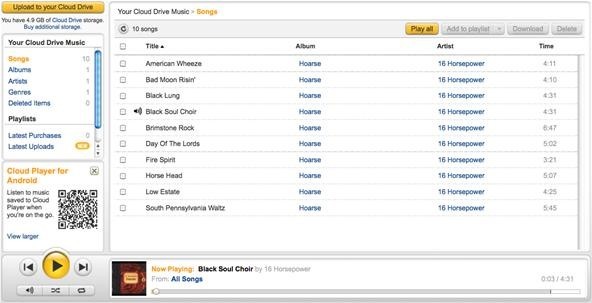 Search for an album you want and purchase, then click the Save it to your Amazon Cloud Drive button to transfer directly to Cloud Drive and Cloud Player. So far, it's been a cinch. And if you own an Android device, streaming your stored music to your smartphone or tablet is just as easy. Just download the free Amazon MP3 app from the Amazon Appstore for Android or the Android Market. How To: View All Messages at Once on Facebook, Without Scrolling Up Forever! News: Oops, New York Times... Why Is Your PayWall So Easy to Hack?